Jay Robert Inslee (/ˈɪnzliː/; born February 9, 1951) is an American politician, author, and lawyer serving as the 23rd and current governor of Washington since 2013. A member of the Democratic Party, he served in the United States House of Representatives from 1993 to 1995 and again from 1999 until 2012. Raised in Seattle, Inslee graduated from the University of Washington and Willamette University College of Law. A politically active student, he became a criminal prosecutor after graduation. He served in the Washington House of Representatives from 1989 to 1993. In 1992, Inslee was elected to represent Washington's 4th congressional district, based around Central Washington, in the U.S. House of Representatives. Defeated for reelection in 1994, Inslee briefly returned to private legal practice. He made his first run for governor of Washington in 1996, coming in fifth in the blanket primary ahead of the general election, which was won by Democrat Gary Locke. Inslee then served as regional director for the United States Department of Health and Human Services under President Bill Clinton. Inslee returned to the U.S. House of Representatives in 1999, this time for Washington's 1st congressional district. The new district included Seattle's northern suburbs in King County, Snohomish County and Kitsap County. He was reelected six times before announcing that he would make another run for the governorship in the 2012 election. He resigned from Congress to focus on his campaign. He defeated Republican Rob McKenna, the Attorney General of Washington. Inslee was reelected to a second term in 2016, defeating Republican Seattle Port Commissioner Bill Bryant, 54% to 46%. Inslee served as chair of the Democratic Governors Association for the 2018 election cycle. As governor, Inslee has emphasized climate change, education and drug policy reform. He garnered national attention for his critiques of President Donald Trump. Inslee, State Attorney General Bob Ferguson and State Solicitor General Noah Purcell sued the Trump Administration over Executive Order 13769, which halted travel for 90 days from seven Muslim-majority countries and imposed a total ban on Syrian refugees entering the United States. The case, Washington v. Trump, led to the order being blocked by the courts and it was later superseded by other executive orders. On March 1, 2019, Inslee officially announced his candidacy for the Democratic nomination for President of the United States in the 2020 election. Jay Robert Inslee was born February 9, 1951 in Seattle, Washington, the oldest of three sons of Adele A. (née Brown; d. 2007) and Frank E. Inslee (1926–2014). His mother worked as a sales clerk at Sears. His father was a well-known high school counselor and football coach, teaching at Tenino High School, Garfield High School and Chief Sealth High School. Frank Inslee later became the athletic director for Seattle Public Schools. Jay is a fifth-generation Washingtonian. In 1969 Inslee graduated from Seattle's Ingraham High School, where he was an honor-roll student and star athlete. He led his high school basketball team to a state championship title his senior year, and also played football. Inslee's interest in environmental issues originated at an early age, with his parents leading groups of high school students on trips cleaning Mount Rainier. He met his future wife, Trudi, at Ingraham during his sophomore year. Graduating at the height of the Vietnam War, Inslee received student deferments from the draft. Inslee's collegiate career began at Stanford University, where he initially intended to study medicine. After a year he was forced to drop out because he was unable to get a scholarship. He returned home and, living in his parents' basement, attended the University of Washington. He graduated with a B.A. in economics in 1973. He then attended Willamette University School of Law, receiving his J.D. degree in 1976. Jay and Trudi were married on August 27, 1972, and have three sons. After Inslee finished law school, they moved to Selah, Washington. Inslee joined the law firm Peters, Schmalz, Leadon & Fowler, working as a city prosecutor. He practiced in Selah for 10 years. He first became politically active in 1985, while advocating for the construction of a new high school. The experience sparked Inslee's interest in politics, emboldening him to run for political office. Inslee ran for the Washington House of Representatives in 1988 after incumbent Republican State Representative Jim Lewis resigned to become a political commentator at a Yakima television station. Inslee's campaign faced an uphill battle because of his ideology and his opponent's strength. Lynn Carmichael, the former mayor of Yakima, was considered the front-runner. Inslee also struggled to balance his more progressive ideology with the conservative leanings of Central Washington. He emphasized his legal experience supporting local average people, farms and businesses. The Washington State Trial Lawyers Association became Inslee's biggest contributor. Inslee attempted to appeal to voters by emphasizing his rural upbringing. When presented with a potential state budget surplus, Inslee called for a tax cut for the middle class, which Carmichael called irresponsible. Inslee claimed Carmichael had supported a sales tax, which she denied. Inslee was an energetic and active campaigner, benefiting from retail politics. In the blanket primary, Carmichael ranked first with 43% and Inslee ranked second with 40%. Republican Glen Blomgren ranked third with 17%. In the general election, Inslee defeated Carmichael 52%-48%. In 1990, Inslee was reelected with 62% of the vote. In the Washington state legislature, Inslee pursued a bill to provide initial funding to build five branch campuses of the Washington State University system. Although the bill failed, Inslee's tenacity made an impression on House Speaker Joe King, who said: "He's not afraid to incur the wrath of the speaker or the caucus." In 1991, Inslee voted for a state energy policy that required the state to devise a cost-effective energy strategy and state agencies and school districts to pursue and maintain energy-efficient operations of their facilities. Inslee served on the Higher Education and Housing Committees. In 1992, Inslee was elected to the United States Congress representing Washington's 4th congressional district in the central-eastern part of the state. His home area of the district, anchored by Yakima, is relatively rural and agriculture-based, while the southeastern part of his district is more focused on research and nuclear waste disposal, anchored by the Tri-Cities. He lost his bid for reelection in the Republican Revolution of 1994 in a rematch against his 1992 opponent, Doc Hastings. Inslee attributed his 1994 defeat in large part to his vote for the Federal Assault Weapons Ban. In Congress Inslee passed the Yakima River Enhancement Act, a bill long held up in Congress, by brokering a breakthrough with irrigators and wildlife advocates. He also helped to open Japanese markets to American apples and to fund and oversee the nation's biggest nuclear waste site at the Hanford Nuclear Reservation near Richland, Washington. Inslee moved to Bainbridge Island, a suburb of Seattle, and briefly resumed the practice of law. He ran for governor of Washington in 1996 and lost in the blanket primary. Democratic King County Executive and former State Representative Gary Locke ranked first with 24% of the vote. Democratic Mayor of Seattle Norm Rice ranked second with 18%, but didn't qualify for the general election. Republican State Senator Ellen Craswell ranked third with 15%, and became the Republican candidate in the general election. Republican State Senator and Senate Majority Leader Dale Foreman ranked fourth with 13%. Inslee ranked fifth with 10%. No other candidate on the ballot received double digits. After Inslee's failed 1996 bid for governor of Washington, President of the United States Bill Clinton appointed him regional director for the United States Department of Health and Human Services. Inslee ran again for Congress in 1998, this time in the 1st congressional district against two-term incumbent Rick White. His campaign attracted national attention when he became the first Democratic candidate to air television ads attacking his opponent and the Republican congressional leadership for the Lewinsky scandal. Inslee won with 49.8% of the vote to White's 44.1%; he had an unintentional assist in his successful return by the conservative third-party candidacy of Bruce Craswell, husband of 1996 GOP gubernatorial nominee Ellen Craswell. The 1st was a swing district for most of the 1990s; Inslee's win marked the third time the district had changed hands in four elections. But Inslee was a major beneficiary of the recent Democratic trend in the Seattle area. He defeated Washington Senate Minority Leader Dan McDonald in 2000 with 54.6% of the vote. In 2002 Inslee defeated former state representative Joe Marine with 55.6% of the vote after the district was made more Democratic by redistricting. He never faced another contest that close, and was reelected three more times with over 60 percent of the vote. In July 2003, after Gary Locke announced he would not seek a third term as Washington's governor, Inslee briefly flirted with a gubernatorial bid before deciding to remain in Congress. During the 2009-10 campaign cycle, Inslee raised $1,140,025. In data compiled for the period 2005 to 2007 and excluding individual contributions of less than $200, 64 percent of Inslee's donations were from outside the state of Washington and 86 percent came from outside his district (compared to 79 percent for the average House member). 43 percent of Inslee's donations came from Washington, D.C., Virginia and Maryland. The largest interests funding Inslee's campaign were pharmaceutical and health-related companies, lawyers and law firms, and high-tech companies. In 2010 he won by a 15-point margin, with 57.67% of the votes cast in his favor. His district went 62% for Barack Obama in 2008, an indication of how strongly the district then leaned Democratic. As a member of the New Democrat Coalition, Inslee accumulated a liberal voting record and expertise on high-tech issues. Inslee was awarded a "Friend of the National Parks" award by the National Parks Conservation Association (NPCA) in 2001 for his support of legislation protecting the integrity and quality of the National Park System. Inslee was "one of Congress's most ardent advocates of strong action to combat global warming," according to The New York Times. He was the first public figure to propose an Apollo-like energy program, in an opinion editorial in the Seattle Post-Intelligencer on December 19, 2002, and in a series of similar pieces in other publications. Inslee co-authored Apollo's Fire: Igniting America's Clean Energy Economy, in which he argues that through improved federal policies the United States can wean itself off foreign oil and fossil fuel, create millions of green-collar jobs, and stop global warming. He has been a prominent supporter of the Apollo Alliance. Inslee strongly believes the Environmental Protection Agency should remain authorized to regulate greenhouse gas emissions. In a 2011 House hearing on the Energy Tax Prevention Act, he said Republicans have "an allergy to science and scientists" during a discussion of whether the regulation of greenhouse gases under the Clean Air Act should remain in place following a controversial court finding on the issue. Inslee was an outspoken critic of the George W. Bush administration's 2003 invasion of Iraq. On July 31, 2007, he introduced legislation calling for an inquiry to determine whether then United States Attorney General Alberto Gonzales should be impeached. Gonzales eventually resigned. Still an avid basketball player and fan, Inslee identified a member of "Hoopaholics", a charity group dedicated to "treatment of old guys addicted to basketball and who can no longer jump", as Inslee has often joked. In October 2009, he played basketball at the White House in a series of games featuring members of Congress on one team and members of the administration, including President Obama, on the other. Inslee voted for the Patient Protection and Affordable Care Act, the federal health care law. In 2011, Inslee voted in favor of authorizing the use of U.S. armed forces in the 2011 Libyan civil war and against limiting the use of funds to support NATO's 2011 military intervention in Libya. Inslee was once touted as a candidate for United States Secretary of the Interior and for United States Secretary of Energy during the Presidential transition of Barack Obama. On March 20, 2012, Inslee left Congress to focus on his campaign for governor of Washington. On June 27, 2011, Inslee announced his candidacy for governor of Washington. His campaign focused on job creation, outlining dozens of proposals to increase job growth in clean energy, the aerospace industry, and biotechnology. He also supported a ballot measure to legalize gay marriage, which passed, and opposed tax increases. He won election by a three-point margin over his Republican opponent, Rob McKenna, with 51% of the vote. On November 8, 2016, Inslee was reelected governor of Washington, defeating Republican former Port of Seattle Commissioner Bill Bryant, 54–46%. During the 2013 session, the legislature failed to create a fiscal budget plan during the initial session, and Inslee was forced to call two special sessions in order to give time for a budget to be created. The Republican-controlled Senate and Democratic-controlled House each passed its own budget and could not agree on one. Finally, in June 2013, Inslee signed a $33.6 billion budget to which both houses had agreed as a compromise. On June 13, 2013, Inslee signed an additional estate tax into law. The estate tax had bipartisan support, and passed the Senate in a 30–19 vote. In December 2013, Inslee was elected to serve as finance chair of the Democratic Governors Association. These jobs are in the thousands and it is not only on the 777X, the first model of the 777X, but all the subsequent derivative models as well. The plan was to prevent Boeing from building part of the aircraft in Washington and part of it elsewhere, as they did with the Boeing 787, which was partially constructed in South Carolina. There have been too many doubts raised about capital punishment, there are too many flaws in this system today. There is too much at stake to accept an imperfect system. Inslee cited the high cost of pursuing the death penalty, the randomness with which it was sought, and a lack of evidence that it is a deterrent. Inslee began his second term in January 2017, proposing full funding of state education (in compliance with the McCleary decision) and addressing mental health needs while also raising worker pay. After newly inaugurated President Donald Trump on January 27 signed an executive order to ban entry from seven Muslim-majority countries, Inslee and Attorney General Bob Ferguson announced their intention to sue Trump, alleging his order was unconstitutional. The civil action, Washington v. Trump, was filed on January 30 and on February 3 successfully earned a temporary restraining order to forbid federal enforcement of certain provisions of the order. An appeal and request to stay filed by the federal government was subsequently denied by the United States Court of Appeals for the Ninth Circuit. Inslee and Ferguson declared their victory over Trump on February 16, after his administration announced it would revise the travel ban to comply with the court decisions. Inslee garnered national media attention during the lawsuit. During the 2017 legislative session, the Washington State Legislature failed to pass a state operating budget by the conclusion of their regular session on April 25. Therefore, Inslee called for a 30-day special session. The legislature failed to pass a budget during that session, forcing Inslee to call a third session, beginning June 22, 2017. As the state's financial year ends on June 30, there was fear of a partial government shutdown. Conflict over resource allocation between rural areas and urban areas was a major source of the conflict. The State Senate passed a budget on June 30 and Inslee signed the $43.7 billion budget into law shortly after 11:00pm. Specifics included in the budget were still being released several hours after it was signed into law. Lawmakers critiqued the haste at which the budget was considered and passed, having only received the 616-page document earlier that day. By the end of the third session on July 20, the legislature had still failed to pass a capital budget concerning long-term goals and improvements. This was the third time during Inslee's tenure the state's budget was passed within the last week of the legislative session. In December 2017 Inslee awarded $6.4 million in grant funding for apprenticeships and career connections for 29,000 youth in 11 communities. He called this initiative Career Connect Washington. It includes a Task Force and several prominent stakeholder groups including Alaska Airlines, Amazon, Boeing, Microsoft, and Kaiser Permanente. As a result of Career Connect Washington, new apprenticeship opportunities have been established including the Aerospace Joint Apprenticeship Committee's registered Youth Apprenticeship program for high school students. Inslee served as chair of the Democratic Governors Association for the 2018 election cycle. Democratic candidates were very successful in the election, gaining 7 net governorships nationwide. In December 2018, Inslee announced new legislation aimed at reducing the state's carbon emissions over a period of approximately two decades. It would require Washington utilities to effectively end the use of fossil fuels altogether by mid-century. It would make Washington "adopt a clean fuel standard", "promote electric and low-emission vehicles", and "provide incentives to renovate existing buildings to reduce" emissions. In January 2019, Inslee said he would provide an expedited process for approximately 3,500 people convicted of small-time cannabis possession to apply for and receive pardons. Throughout 2018, speculation rose that Inslee was considering a run for President of the United States in the 2020 election. He garnered national attention because of Washington v. Trump, a lawsuit challenging the Trump Administration's order to ban entry from seven Muslim-majority countries. While serving as chair of the Democratic Governors Association during the 2018 gubernatorial elections, Inslee oversaw Democrats gaining seven net governorships nationwide, further propelling him into the national spotlight and fueling speculation that he would run. Inslee cited climate change as his primary motivation for running, strongly criticizing the Trump Administration's policies. On January 2, 2019, it was reported that Inslee was beginning to form an exploratory committee, the first step in a campaign. 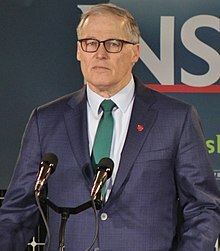 Inslee would be a dark horse candidate; he has rarely been included in polling for the primary, is still not well known outside Washington and has made few trips to early primary states such as Iowa and New Hampshire. But Inslee has pointed to former Presidents Jimmy Carter and Bill Clinton, calling them "pretty much unknown governors of small states" and adding, "this is a wide-open field. No one has a lock on this. No one has a total crystal ball as to what the nation wants." On February 27, 2019, it was reported that Inslee would formally launch his presidential campaign on March 1. On March 1, 2019, Inslee announced his presidential campaign bid, stating his main campaign focus would be combating climate change. ^ a b Long, Katherine (October 14, 2014). "Governor's father, Frank Inslee, dies: teacher, coach, counselor". The Seattle Times. Retrieved January 4, 2019. ^ "inslee". Freepages.genealogy.rootsweb.ancestry.com. Retrieved September 11, 2012. ^ a b c d Garber, Andrew (July 14, 2012). "Jay Inslee: Organized sports taught the importance of teamwork". The Seattle Times. Retrieved January 4, 2019. ^ a b "Inslee shaped by experience as a high school athlete". King5. October 10, 2012. Retrieved January 4, 2019. ^ "Game roster: KIRO vs. Team Inslee". KIRO Radio. November 6, 2013. Retrieved January 5, 2019. ^ Raftery, Isolde (June 2012). "Jay Inslee's uphill battle". Seattle Business Magazine. Retrieved December 31, 2018. ^ a b Welch, Craig (August 25, 2012). "Inslee's political career took off as Democrat in GOP territory". The Seattle Times. Retrieved January 7, 2019. ^ "WA State House District 14 Seat 2 - Blanket Primary Race - Sep 20, 1988". Our Campaigns. Retrieved September 11, 2012. ^ "WA State House District 14 Seat 2 Race - Nov 08, 1988". Our Campaigns. Retrieved September 11, 2012. ^ "WA State House District 14 Seat 2 Race - Nov 06, 1990". Our Campaigns. Retrieved September 11, 2012. ^ Yakima Herald-Republic, June 11, 1989. ^ "HB 1022 - 1991-92". Washington State Legislature. Retrieved March 4, 2019. ^ "Lewiston Morning Tribune - Google News Archive Search". google.com. ^ "Ellensburg Daily Record - Google News Archive Search". google.com. ^ Postman, Sorrano, David, Barbara (November 29, 1995). "Former Rep. Jay Inslee Joins Governor's Race". Seattle Times. Retrieved June 30, 2011. ^ HR 1690, 103rd Congress, Library of Congress bill page. ^ Inslee Sticks To Campaign Game Plan -- Message Attempts To Boost His Profile, September 3, 1996. ^ "WA Governor - All Party Primary Race - Sep 17, 1996". Our Campaigns. Retrieved September 11, 2012. ^ Rosenthal, Brian M. (September 6, 2012). "Inslee-Clinton fundraiser almost sold out, boasts excited campaign". The Seattle Times. Retrieved January 3, 2019. ^ Candidates Are Held Hostage by Scandal, Washington Post, October 11, 1998. ^ Inslee Won't Run For Governor, Joel Connelly, Seattle Post Intelligencer, September 8, 2003. ^ "Campaign Funding Sources". Inslee Contributions Illuminated. maplight.org. Retrieved June 30, 2011. ^ Reed, Sam. "Congressional District 1". 2010 Election Results. Washington Secretary of State. Archived from the original on March 21, 2011. Retrieved June 29, 2011. ^ "The Seattle Times: Tech Tracks". nwsource.com. Archived from the original on November 18, 2007. ^ Broder, John M. (March 9, 2011). "At House E.P.A. Hearing, Both Sides Claim Science". The New York Times. p. 17. Retrieved January 22, 2017. ^ "New Apollo Project can help us unplug our need for oil". seattlepi.com. ^ Wing, Nick (March 9, 2011). "Jay Inslee: Republicans Suffer From 'Allergy To Science And Scientists'". Huffpost Politics. The Huffington Post. Retrieved July 1, 2011. ^ "Flashback | Political football now Inslee's game, Seattle Times, September 4, 2007. ^ Daly, Matthew (October 8, 2009). "Local News | Lawmakers play hoops with Obama at White House | Seattle Times Newspaper". Seattletimes.nwsource.com. Retrieved August 29, 2010. ^ "Final Vote Results for Roll Call 165". Clerk of the US House of Representatives. March 21, 2010. Retrieved March 4, 2019. ^ "Congress Votes on Libya". 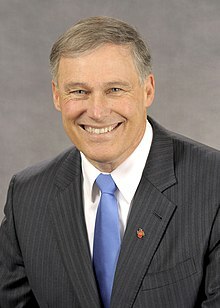 Inslee Supports Adventure in Libya. OpenCongress.org. Archived from the original on July 1, 2011. Retrieved July 1, 2011. ^ Song, Kyung M. (March 20, 2012). "Inslee leaving U.S. House but still eligible for pension". The Seattle Times. Retrieved December 31, 2018. ^ Inslee Announces Run For Governor Archived October 15, 2011, at the Wayback Machine, Liz Jones, KUOW, June 28, 2011. ^ Inslee takes strong lead, but McKenna won't concede, Jim Brunner, Seattle Times, November 7, 2012. ^ Reed, Sam. "WA STATE Gubernatorial results". WA STATE SEC OF STATE. Archived from the original on February 23, 2013. ^ "Washington Gov. Jay Inslee calls second special session". Oregon Live. June 11, 2013. ^ La Corte, Rachel (June 30, 2013). "Gov. Inslee signs $33.6 billion state budget". Kirotv. ^ "Washington Gov. Jay Inslee signs estate tax fix into law". Oregon Live. June 13, 2013. ^ Burns, Alexander. "DGA appoints leaders for 2014". Politico. Retrieved December 9, 2013. ^ Kim, Hana (January 4, 2014). "Governor Inslee says Boeing deal could open new industrial plateau". Q13 Fox. ^ "Boeing pact with Machinists union called turning point for labor". TribLive. January 4, 2014. ^ "Inslee halts executions in state while he is governor". The Seattle Times. February 11, 2014. Retrieved February 12, 2014. ^ "Washington state to suspend death penalty by governor's moratorium". The Guardian. February 11, 2014. Retrieved February 12, 2014. ^ O'Sullivan, Joseph (January 9, 2017). "State lawmakers face tough fight over education funding as legislative session opens". The Seattle Times. p. B1. Retrieved February 21, 2017. ^ Burns, Alexander (January 30, 2017). "Legal Challenges Mount Against Trump's Travel Ban". The New York Times. Retrieved February 21, 2017. ^ Burns, Alexander (February 4, 2017). "How Washington State Upended Trump's Travel Ban". The New York Times. Retrieved February 21, 2017. ^ Dolan, Maura; Kaleem, Jaweed (February 16, 2017). "Trump says he will issue a new order after a 'very bad decision' blocked his initial travel ban". The Los Angeles Times. Retrieved February 21, 2017. ^ a b Brunner, Jim (February 21, 2017). "Jay Inslee for president? Governor's profile is on the rise". The Seattle Times. Retrieved February 21, 2017. ^ La Corte, Rachel (June 12, 2018). "No end in sight as Washington lawmakers edge toward a third special session". The Seattle Times. Retrieved January 3, 2019. ^ Camden, Jim (July 1, 2017). "Legislature passes $43.7 billion budget, and taxes to pay for it; Inslee signs before midnight". Spokesman-Review. Retrieved January 3, 2019. ^ Brand, Natalie; Graf, Heather (July 20, 2017). "Washington lawmakers adjourn with no capital budget". King5. Retrieved January 3, 2019. ^ Santos, Melissa (June 27, 2017). "Threat of shutdown looms as Legislature heads into triple overtime over budget". The News Tribune. Retrieved January 3, 2019. ^ "Inslee awards $6 million to create apprenticeship and career connections for 29,000 youth in 11 communities". Medium. December 8, 2017. ^ "Career Connected Washington Task Force". Workforce Training & Education Board. ^ "Washington voters don't think schools prepare kids for careers. The state is trying to change that". The Seattle Times. October 31, 2018. Retrieved November 16, 2018. ^ "Washington governor elected next DGA chair". My Columbia Basin. December 4, 2017. Retrieved December 5, 2017. ^ a b Dovere, Edward-Isaac (January 2, 2019). "Jay Inslee Is Betting He Can Win the Presidency on Climate Change". The Atlantic. Retrieved January 3, 2019. ^ Wilson, Reid. "Washington governor plans major climate initiatives". The Hill. Retrieved December 11, 2018. ^ "Washington Gov. Inslee to pardon thousands convicted of marijuana possession". NBC News. Retrieved January 5, 2019. ^ Wang, Amy B. (February 5, 2017). "How Washington state became the epicenter of resistance to Trump's agenda". The Washington Post. Retrieved February 21, 2017. ^ a b Brunner, Jim (December 6, 2018). "Gov. Jay Inslee's new PAC raises $112,000 as he 'actively' considers presidential run". Seattle Times. Retrieved December 7, 2018. ^ Kroll, Andy (January 2, 2019). "Jay Inslee, the 'Climate Candidate,' Joins the 2020 Race". Rolling Stone. Retrieved January 3, 2019. ^ Dovere, Edward-Isaac (January 2, 2019). "Jay Inslee Is Betting He Can Win the Presidency on Climate Change". The Atlantic. Retrieved January 2, 2019. ^ "Jay Inslee Is Running For President — You Know, the Governor of Washington". National Review. January 2, 2019. Retrieved January 2, 2019. ^ "Jay Inslee 2020 presidential run: Sources confirm he'll announce on Friday". KIRO. February 27, 2019. ^ "CNN - Breaking News, Latest News and Videos". m.cnn.com. Retrieved March 1, 2019. Wikimedia Commons has media related to Jay Inslee.